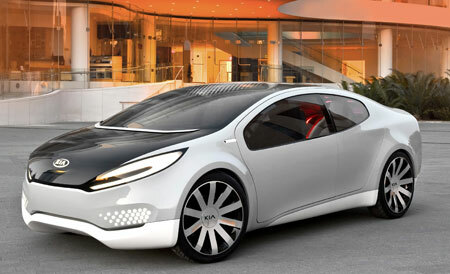 Kia has unveiled a plug-in hybrid concept called the Ray at the Chicago motor show. The futuristic looking car claims a total range of 746 miles between fill ups and should be able to go 50 miles on electric power alone. As a result, Kia claims the Ray should be capable of a whopping 202mpg. It is styled as a sleek coupe, which Kia says is specifically designed to reduce drag. At Autoblog we think it might just be the best looking eco car we've seen so far. One element that helps the aerodynamics is the lack of door mirrors or door handles – instead the Ray has a series of motion detecting cameras that assist with lane changing and door opening. There are a host of other energy saving measures on the car too, but the one we like the best is the "cool-glazing" roof, which can reduce the interior temperature of the car and therefore the need for the air conditioning. Fingers crossed that at least some of the styling elements make it through to a production version of the car.